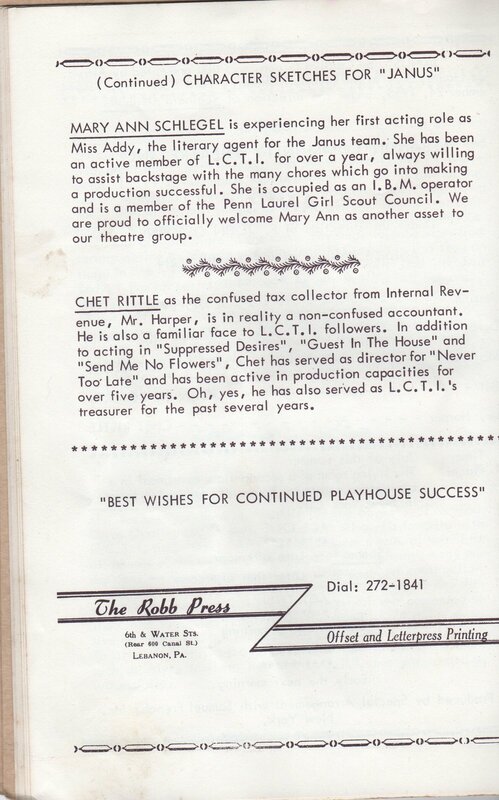 The Lebanon Daily News was good about giving LCTI publicity for its productions. This piece ran in the June 19, 1967 edition, three days before the opening night. I don’t really know what her intentions were, but I have to assume that Carolyn Green meant for her only Broadway play to be a twist on a typical French bedroom farce with a female protagonist juggling two male lovers rather than the traditional male juggling two or more females. 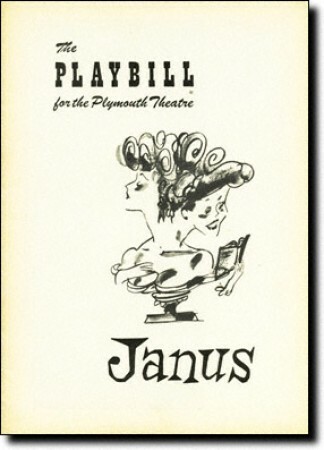 In any case Jessica is certainly the protagonist of Janus, and she’s a strong female role for the mid 1950s even though there are some attitudes that we would now find outdated. This ran on June 21, the night before our opening. Alas, if there was an article featuring Molly Costello I haven’t been able to find it. Here is where I wanted to include a one or two paragraph synopsis of the play, but I got carried away and it ran a bit longer, so I made it a separate post. 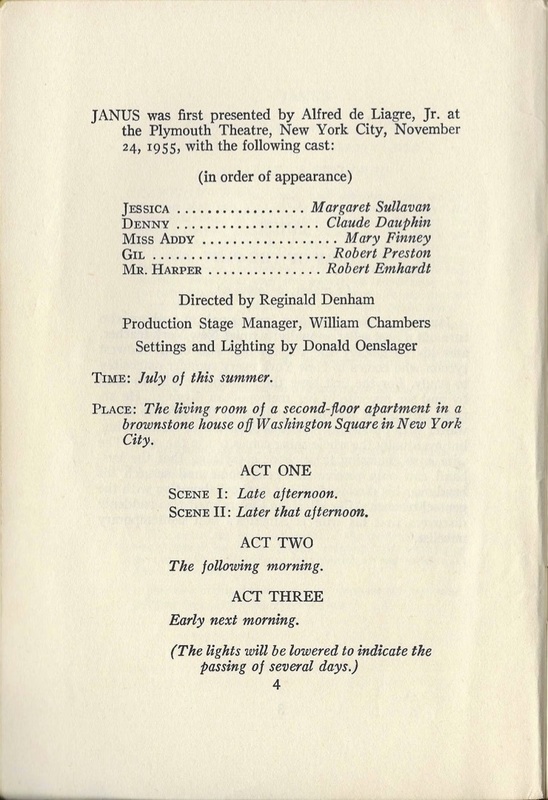 You can find it on the Janus—A Synopsis page along with a fascinating feature from Life magazine from February 13, 1956, about the original production of the play, as well as a little bit of information about playwright Carolyn Green along with a photo of her with her children. I mentioned that I grew to love the play, and I also grew to love my character, Denny. He and I did have a number of things in common. And some of his lines were quite easy for me to utter with conviction. I could think of a number of children who fit that description as I said those lines. Because this was community theatre, I had to provide my own costume and personal props. The costume was no problem as I had an olive green suit that I thought was appropriate for Denny, and I bought a very conservative tie (a black one) at Dinger’s clothing store in Myerstown. Betts had already supplied me with the pipe that my character required (I would be feigning smoking it but Gil would actually be smoking cigars and cigarettes), and Randy Klopp provided me with an old pair of his eye glasses. Randy rode with me to the dress rehearsal. I’m not sure if he had some task to perform in connection with the play, or if he just wanted to get an advance look. He had tickets for the following night, our opening on Thursday, as he was taking Pam Barry to see it. For my part I was excited that we’d finally get to perform the play in costume—with props—with all the effects in place—with no interruptions from John, the director. My first inkling that things might not go too smoothly was when our Jess (Molly) arrived. 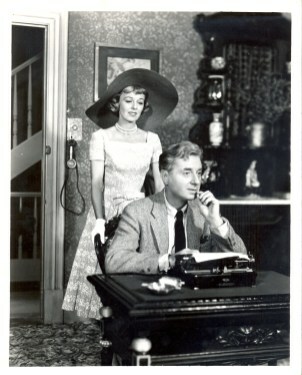 She had just come from the hairdresser’s where she had described the play and her character to the hairdresser and asked her to come up with an appropriate style. I don’t know what her stylist was thinking but what she had created was, well, weird. I was not the only one who thought so. Oh, well. Too late now. Time to start the dress rehearsal. I’m not going to describe everything that happened that evening, because I can’t. It’s all a blur of John stopping the action every couple minutes. He stopped it because he didn’t like something we, the actors, were doing. We had to keep repeating lines. Whole bits of scenes. Back up. Do that again. Do it this way. No, do it that way. It was as if the previous month of rehearsals had not happened. It seemed like everything we were doing was now wrong. He stopped the action because he wasn’t satisfied with something in the lighting or the sound effects or the curtain rising or falling. I seem to recall that our Stage Manager, Jim Bostic, came in for more than his share of criticism. With us actors John was generally patient and at least civil. Not so with the Stage Manager, with whom he could be very sarcastic and cutting. And with that British accent of his, he could be very biting indeed. Suffice it to say it was a very long evening. And I now had a summer job at the VA Hospital and had to get up at 5:30 the following morning in order to be at work by 6:30 am. Actually both Randy and I had jobs at the VA Hospital and we always drove there together. John discussed a few more things with us, and then asked us to go through the final act one more time. Or maybe it was the first act. I don’t know. It was one of the acts. He promised not to interrupt. Everyone was tired, but we complied. I have no idea what time it was. John did eventually release us, and Randy got into the car with me for the drive back to Richland. He couldn’t or wouldn’t stop talking about what a mess that so-called dress rehearsal had been and that he had never seen anything like it. At first I agreed with him. But then it got personal. He didn’t criticize me as I recall, but he was critical of the other actors, especially Molly as Jess. He said she ran around the stage like a chicken with her head chopped off. Randy was my oldest friend in Richland. When we moved there in 1957, we initially lived in the apartment on the second floor of his parents’ house, and he and I had been good friends, frequently doing things together, ever since. Like now we even had summer jobs at the same place and carpooled together. But when he criticized the other actors, he might as well have been criticizing me. It stung. I was in shock, but I was too tired to say anything. Sure, Randy. Keep twisting that knife.